Ghana Workshop 2015 | Ghana Workshop 2015 – Raumgeschichten e.V. The effectiveness of some development efforts may be questionable. However, when 24 people commit themselves to help, become active, and sacrifice their free time to improve living standards in rural Ghana, this is awe inspiring. Raumgeschichten e.V. lead a four week workshop during the summer of 2015. The Raumgeschichten team (Elena Cuntz, Nutan Jäger, Sabine Tastel, Tabea Kaltenbach) was lead by Markus Kaltenbach and Matthias Schäfges with the goal of reinventing the African Mud House; using available and affordable materials, combining modern and traditional ways of building, and constructing a case study house showing the beauty of earthen building techniques. Together with Nka Foundation, we teamed up with the work force from the local village to bring our design (initially designed by Markus Kaltenbach and Viktor Hess for the Nka Foundation 2014 Mud House Building Contest 2014) into being. Rammed earth and sun-dried adobe bricks were the main building techniques, using earth directly from site. Wood used in construction was bought locally and reused many times. Coconut and grass fibres reinforced the adobe bricks while a pure combination of gravel and sand were the only ingredients of the rammed earth mix (no cement added). That, and the sweat that comes from mixing by hand, day after day. By utilizing earthen building techniques and collecting natural stones for use from a nearby village, the amount of cement (one of the main cost drivers), could be drastically reduced compared to local building practices. In terms of climatic adaptation, the team consulted with Markus Krauss from the famous German engineering company Transsolar. Besides the cooling mass of the walls, an optimised building orientation, and natural shading approaches, a solar chimney on the roof helps to create a comfortable interior climate. Furthermore, outdoor spaces were designed with special importance and emphasis. During the building process, 17 local workers from the neighbouring village were hired, which not only stimulated the local economy, but also brought these workers in contact with low-tech and sustainable building methods, training them and raising capacity. Since palm oil production is currently the main source of livelihood, the workshop has helped to raise the economy of the workers village substantially. The building is gaining notoriety, prompting interest from visitors to hire the workers to build with rammed earth, as well. Besides learning the process of building, the workshop included theoretical lectures and small design labs. A lecture by Prof. Rexford Oppong from KNUST University, making an impressive statement about building with earth, was a special highlight. 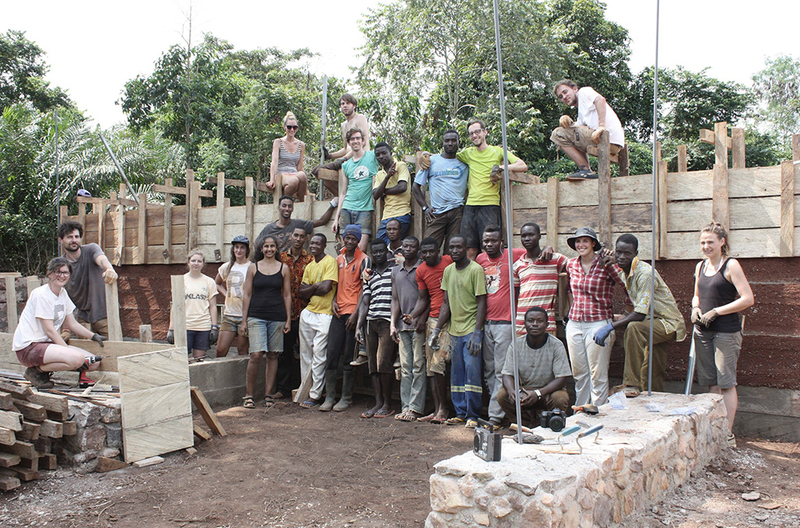 The international group of volunteers from England, Italy, Nigeria and Germany, with and without an architectural background, gained not only an incredible experience on the construction site, they experienced a foreign culture, made new friends, and gained a sense of how beautiful modern earth housing can be. At the end of August, the building was handed over to the Nka foundation as part of their Abetenim Art Village. It will serve as accommodations for future visiting volunteers and international artists supporting the local community, being a catalyst for the entire region and embodying a vision for sustainable architecture.